The 34th edition of Modef Expo, an international trade fair of furniture and decoration, will showcase modern and classical design themes when it gets under way next month (November 3 to 7) in Turkey. To be held at the Hikmet Sahin Cultural Park International Exhibition Centre at Inegol in Busra, the fair aims to line up a wide range of products and eye-catching samples of furniture and interior décor. To promote the show, organiser Modef Fuarcılık has strengthened its network of agents in the countries that offer growth potential and has planned a series of road shows in the Middle East, North Africa, Turkic countries and the Balkan states. In addition, the show’s international marketing and visitor promotion partners Antexpo and As Expo have networked with leading buyers in the furniture industry in more than 35 countries including Iran, Iraq, UAE, Saudi Arabia, Jordan, Lebanon, Egypt, Bulgaria, Algeria, Morocco, Tunisia and Kazakhstan. Last year, Modef Expo featured 160 exhibiting companies and brands, and attracted 15,034 key buyers from targeted visitor markets and 2,354 visitors from across 59 countries. Modef Expo is primarily aimed at companies that are looking to purchase a wide range and the best quality of products at competitive prices. 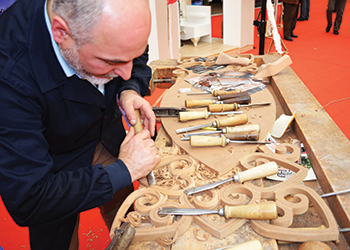 A craftsman at work at a previous edition of Modef Expo. 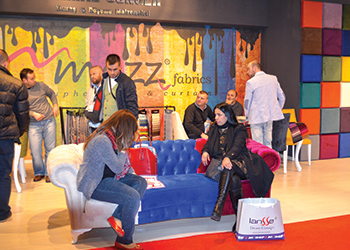 Visitors to the expo will find themselves in the heart of the Turkish furniture industry, which is Inegol, said a spokesman for Modef Fuarcılık. Inegol sources its raw materials locally and most of its products are world class in quality, he said. The region, therefore, produces goods at low costs - the reason why exports are competitively priced. “The furniture industry in Turkey is very dynamic and this has resulted in the international competitiveness of its manufacturers, particularly when it comes to quality, design and price,” said the spokesman. Also, Turkey’s location provides easy access to European and Middle Eastern countries, paving the way for future business transactions, he added. Elaborating on Inegol’s share in the country’s furniture market, he said: “At present, around 25 per cent of the $6-billion furniture production in Turkey is marketed across global markets. Inegol constitutes 35 per cent of this and aims to hit the $1-billion mark in exports next year. “With more than 260 large-scale factories, 1,000 showrooms and 1,500 production centres, Inegol has maintained its position as the largest furniture producer and exporter in Turkey.